Going Solo may be the sequel to Boy, but I read Roald Dahl's second memoir first. 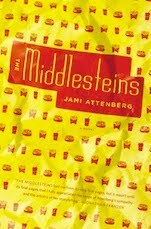 I think my copy must have come from a yard sale, because it has a blue hardback cover and no dust jacket. The inside is printed with photos of a young Dahl enjoying his first real adventures. I always find it heartening when I discover that the authors I enjoy have led interesting lives. And Roald Dahl has certainly led an interesting life. In Going Solo he chronicles his 20s. 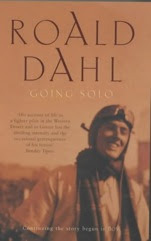 Starting with his job with the Shell Oil Company in East Africa (now Tanzania) and following him through his adventures as an RAF pilot during the Second World War, Dahl writes about himself with the same joy and delicious language he uses in his other novels. And like his other stories, Going Solo doesn't fit comfortably in one category. It's a story about the adventure of being young and having real responsibilities, and although Dahl may be best known for his children's writing, he knows how to speak to an adult audience. Including details such as learning to speak Swahili (fluency in the language brought a pay-raise in those days) and the day a lion took off with the cook's wife (who ended up being alright), Dahl plays with both the adventure and the danger of the unknown, inviting you into his experiences and leading you along. The real adventure, though, starts when war breaks out. Dahl signed up for the RAF, deciding he wanted to be a fighter pilot. The problem, though, was that he was too tall for the tiny planes and the top of his head stuck out of the top above the windscreen. But despite many suggestions that he might be better off in a larger bomber, Dahl stuck to his guns and became, by his account, a very good flier. His adventures, both in the air shooting down enemy planes and on the ground being strafed, are described with a kind of fondness. He was stationed primarily in Greece during the war - after Greece fell to the Nazis he was moved to the Middle East and then to Egypt - and despite a near-fatal crash in Libya, he made it through the war relatively unscathed. But just because he wasn't constantly fighting air battles with German planes doesn't mean the story slows down. Dahl is a gifted author and he knows how to use details to make a story sing. His descriptions of Greece alone make this a book worth reading, and I could almost taste the tanginess from the way he described the eating fresh olives. But what he really does in Going Solo is bring alive the realities of war for soldiers who weren't in the middle of the action. He talks about boredom and the excitement, and he instills in you the watchfulness necessary to avoid being killed by enemy strafing. And he does it all with a sly grin, reminding you that everything worked out alright in the end - he is telling you the story, after all. Going Solo is a book I return to when I want an easy but entertaining read. Dahl has a way of pulling you into his story, and his languages skips off the page so easily that it feels more as though you're being told a story than actually reading it. And that's the beauty of a good storyteller, their story becomes your own and their memories become your anecdotes.